Bob is an experienced writer with publications for children and for adults both in print and on the web. 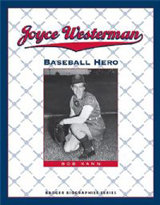 Bob has written 6 Badger Biographies for the Wisconsin State Historical Society Press. The Badger Biographies are written for children between the ages of 7 to 12 and explore the stories of real Wisconsin people, some famous and some not-so-famous but all who made a difference in Wisconsin history. 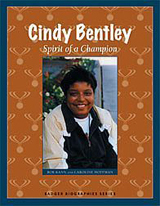 This book tells the story of a woman who lived her dream of becoming a professional athlete. In a time when women had few opportunities for careers, and next to none in professional sports, Joyce and her teammates proved to the world that women have what it takes to play baseball. 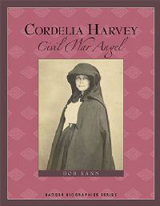 This book tells the story of Cordelia Harvey, who was known as ‘The Wisconsin Angel” and “The Florence Nightingale of Wisconsin” for her compassionate and competent care for Wisconsin soldiers during the Civil War. The wife of former governor Louis Harvey, she advocated for better care for hospitalized soldiers, took care of the wounded, gave hope to the sick, and comfort to the dying. This book about Lizzie Kander celebrates the life of Milwaukee’s early 20th century culinary wonder. 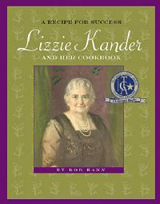 Lizzie Kander’s Settlement Cookbook assisted numerous young Jewish immigrant girls to learn American-style cooking and the proceeds helped build Milwaukee’s first settlement house and later the Jewish Community Center. The Settlement Cookbook became the most successful fundraising cookbook in history. 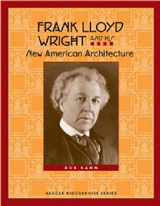 This book tells stories of the great American architect Frank Lloyd Wright from his boyhood adventures to the creation of visionary buildings like the Guggenheim Museum”. The book brings to life some of the eccentric stories behind some of Wright’s landmark buildings. Readers find out about Wright’s Oak Park home, known to locals as “the house with a tree growing through it;” the Robie House, which is shaped like a battleship; and Fallingwater, which is built on a waterfall. They learn how Wright successfully built the Imperial Hotel in Tokyo to withstand earthquakes, and how the Johnson Wax Building and Guggenheim Museum set new standards in institutional architecture. 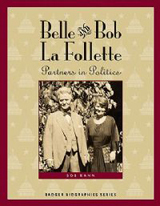 This book tells the story of Bob and Belle La Follette. “Fighting Bob” was famous for rolling up his sleeves and fighting to reform government corruption. A formidable activist in her own right, Belle was an advocate for world peace, an agitator for the women’s vote, the first woman to graduate from the University of Wisconsin’s Law School, and Bob’s most trusted advisor. This book celebrates the life of one of Wisconsin’s most inspirational leaders and activists. Born with an intellectual disability as the result of fetal alcohol syndrome, Cindy Bentley spent much of her childhood at the Southern Wisconsin Center for the Developmentally Disabled. No one expected her to learn the skills necessary to live on her own. To everyone’s surprise, including her own, she did that and much more including having dinner with two presidents and giving speeches in front of thousands of people. This online publication celebrates the 125th anniversary of the Madison Public Library by providing 125 thematically organized stories from the library’s history. Wrote the training manual for an intergenerational reading program bringing the University of Wisconsin-Whitewater Children’s Center (UWW-CC) and Fairhaven Senior Center (FSC) together to promote reading to preschoolers. Combining his training acquiring a Ph.D. in Curriculum and Instruction and his experience working with children and youth as a teacher, performer, and artist-in-residence, Bob has written four curriculums and contributed to several curriculum projects. For each curriculum, he tries to blend the motivational insights he’s acquired as an entertainer with the expertise he’s developed as an educator to create dynamic curricular materials. This unique online curriculum provides suggestions for youth-based service activities based upon projects that have successfully been undertaken by youth. With perseverance, ingenuity, and compassion, youth of all ages have formed organizations with their peers to tackle many of society’s most pressing problems. This is an extraordinary compilation of stories chronicling how youth have changed the world. R.E.S.P.E.C.T. (“Reaching Every Student’s Potential through Effective Cooperation and Teamwork) is a supplementary online curriculum for teachers designed to help high school students successfully transition to the work force. Specifically, it provides resources to enable teachers to help high school students develop essential interpersonal skills that are desirable in the work force, promote diversity, teach acceptance and bring students of all abilities together with these innovative curriculum ideas. How do we help students to understand that they are capable of changing the world? How do we nurture self-esteem, confidence, pride, and a sense of responsibility for the well-being of our community and beyond? One way to achieve this is to help them find “the hero” within themselves. That is, to have them experience something in which they act heroically and thereby recognize their abilities to make the world a better place to live. This curriculum provides teachers with guidelines and activities so that they can help students understand what a hero is, what qualities are heroic, how heroes are different from celebrities, what are the different kinds of heroes, and ultimately how they can engage in a community service project to act heroically themselves. This online curriculum provides teachers with materials to teach students fourth-grade and older about the Jewish history of the state of Wisconsin. The student curriculum and associated Teacher’s Guide offer educators dynamic material to supplement instruction related to Wisconsin history. The curriculum includes chapters on “An Introduction to Judaism,” “Immigration: The Push and the Pull to Wisconsin,” “The Holocaust,” “Jewish Businesses and Jobs,” “Giving Back to the Community: Philanthropists,” “Jewish Artists,” “Sports and Jews,” and “Fixing the World: Wisconsin Jews and Politics.” This resource can be used to teach students the ABC’s of Wisconsin Jewish history including why learning and community are important to Jews, how and why Jewish immigrants came to Wisconsin, tales of Holocaust survivors, and stories of noted Wisconsin Jews including Harry Houdini, Bud Selig, Russ Feingold, Golda Meir, and much more. This “train the trainers” curriculum provides assisted living providers and other trainers a road map for how to plan effective training programs. Topics addressed in this “how to” manual include the benefits of over planning, formats for delivering content, maintaining high energy levels, the value of humor, creating a healthy environment for learning, using your voice effectively, questioning techniques, and self-evaluation. Bob wrote an activity guide to supplement performances at the Madison Civic Center. Bob edited a bicycle safety manual to support the Wisconsin DOT and City of Madison’s bicycle safety outreach programs. Bob was a contributing writer to an innovative elementary school mathematics and science curriculum. Bob was a contributing writer for a middle school writing manual.